Despite one PCS season just ending, we know that the next is always right around the corner. Some lucky ducks have already heard where they’re heading next, and if you’re exceptionally lucky, you may be heading southward for a balmy Florida winter in 2016. One fun-filled and beautiful area of Florida that many military families have the good fortune to PCS to is the greater Destin area. These communities near Hurlburt Field and Eglin AFB have experienced significant resurgence since the recession, and the housing market in that area is growing increasingly competitive. On base housing is improving under the direction of the privatized housing communities, too. Let’s not kid ourselves, though. If you move to Florida, you want waterfront. You want a dock for the jet skis, the kayaks, and the boat. It doesn’t matter that right now you’re reading this cuddled up under a blanket, shivering, with a mug of steaming coffee. It doesn’t even matter that you don’t actually possess any of those toys either. Those are just details. I know that you have a creative imagination, so sip a little more coffee, warm up, and let’s imagine that glorious, tropical, waterfront abode in Florida that Uncle Sam will oh, so graciously bestow upon you next year. Unfortunately, the BAH budget doesn’t always play nicely with our imaginary housing games, but we can still dream! Let’s take a look at the types of waterfront homes listed on MilitaryByOwner that you could afford on BAH, and we’ll go up from there all the way to the type of home you could potentially afford if both partners are working, you invested well for decades, and you scored a decent inheritance (and maybe the lottery). Just so that you’re aware, BAH for Eglin AFB ranges from $1,044 for an E-1 without dependents all the way up to $2,232 for an O-7 with dependents. Below you’ll find a snapshot of BAH rates so that you can better understand the housing price ranges we’re looking at in this post. If you want to live right on the water in a minimal upkeep home, a waterfront townhouse might be a great fit for you. This two bedroom, two and a half bathroom home would work well for a single person seeking a comfortable living space and an office, two single service members splitting costs on a great home, or a couple who know that they’ll need a guest room for family who’ll want to visit now that your home overlooks the water! You could enjoy year-round al fresco dining on the patio while watching the boats sail past. A little higher in the BAH budget, this home includes a lot of additional costs such as cable and garbage. This neighborhood offers so many entertainment add-ons that you may find the wiggle room elsewhere in your budget to spring for this beautiful rental home. After you’ve finished coveting the views of the sun setting off the dock, make sure to check out the great water features in the community area for the kids and the gym facilities for mom and dad! 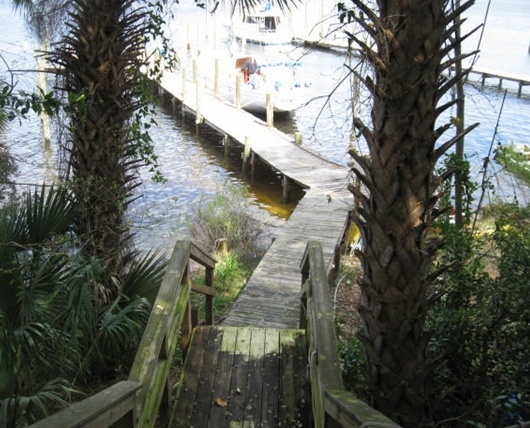 3) Your own dock--enough said! When you’re done checking out the patio and great views that come with this characteristically Florida home, you’re going to have to find a boat so that you’ll have something to park out on your personal dock out back. 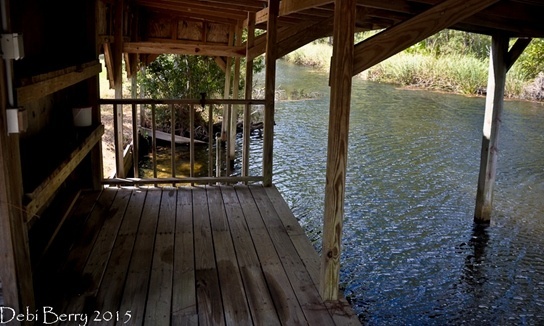 There are 2,000 square feet of indoor living space, but the best square footage here is the massive 80 foot of Watson Bayou waterfront to call your own. If you want the best of both worlds--upgraded indoor living space and outdoor space that overlooks the water--this home is calling your name. It’ll require a little stretching of BAH dollars, but the hardwood floors, updated kitchen with gas stove, screened-in porch, and custom wood built-ins make this a unique find among rental homes in the area. If you want to buy on the waterfront, several homes currently listed on MilitaryByOwner are within BAH price range. Many of the waterfront homes listed on MilitaryByOwner feature homeowner’s associations, and the monthly fees can add up quickly, so make sure to include that fee when calculating whether a waterfront home in an HOA community is in your military family’s budget. 5) Updates, granite, and a boat slip, oh my! This updated two bedroom home offers minimal maintenance for service members and small military families who want a fun, easy Florida lifestyle! 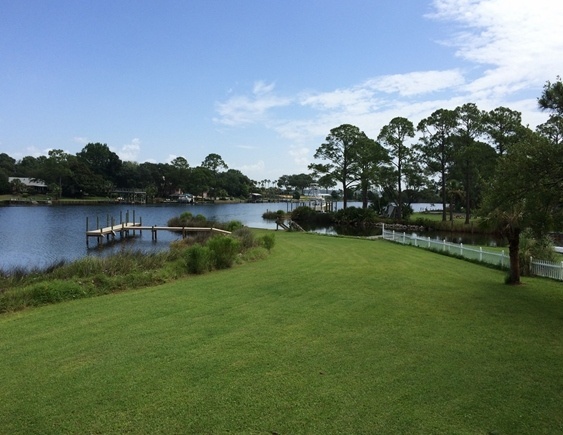 Featuring great water views and a deeded boat slip, you can head out onto the water on your day off without worrying about either lawncare or property maintenance because it’s all included in your HOA fees! 6) For the watersports loving family. 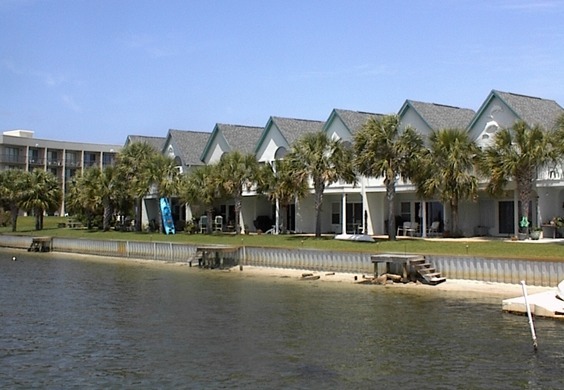 When you think of waterfront in Florida, you may not think “bayou,” but bayous abound throughout the Panhandle, offering families both greater privacy and a more affordable option for a waterfront lifestyle than the pricey seafront homes. This particular home features multiple outdoor living spaces and a covered boat dock that can house not only your boat, but also up to three jet skis! 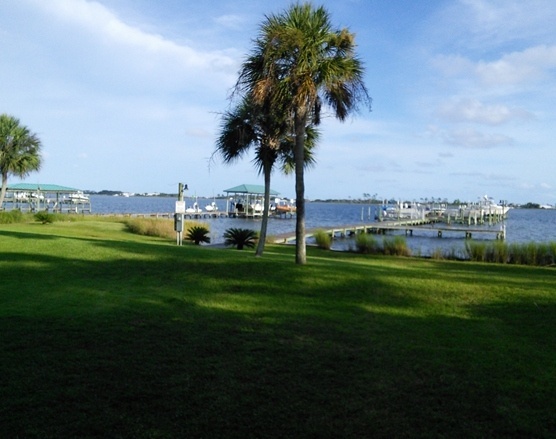 The bayou offers calmer waters that lead out to the bay. 7) Huge home with water views from a to-die-for kitchen. 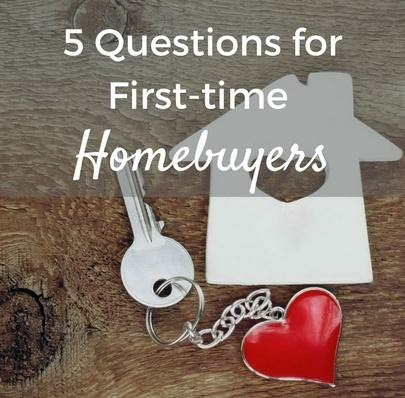 I don’t typically like to describe kitchens or any aspect of a home as something “to die for,” but wait until you see the light fixtures and backsplash in this newer home. Then, look past the windows of the breakfast room to see the gorgeous water views. Two words for this home: Virtual Tour. 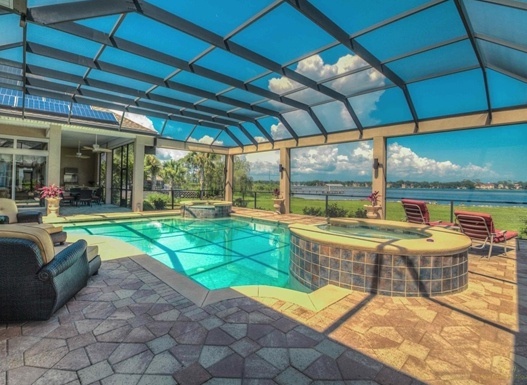 The tour will definitely help make picturing your waterfront Florida lifestyle much easier! 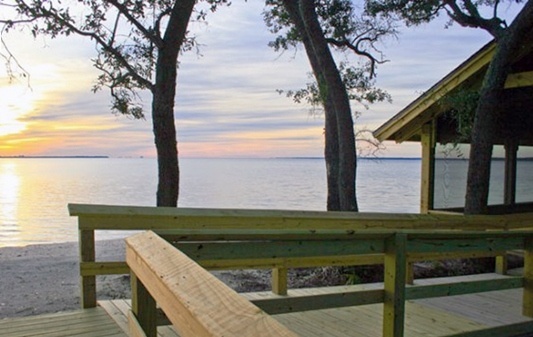 8) The waterfront home you'll wish you'd saved for! With spectacular features that include designer ceiling cutouts, wrought iron stair rails, custom built-ins throughout, a wet bar, a home theater room, a butler’s pantry, and quite possibly the largest master spa bathroom, closet, and bedroom combo on MilitaryByOwner, you might almost miss the fact that the home is waterfront. Almost. You definitely won’t miss the view, though. Especially not when you’re laying out back under a screened-in porch watching the kiddos frolicking in the salt water pool and spa (if you were reading this out loud, this is where you’d insert a really big sigh). Would anyone like to buy me this house? 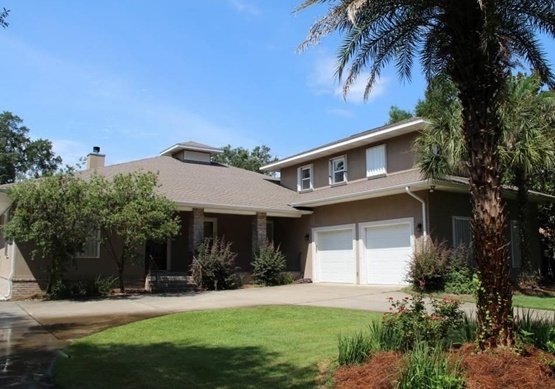 *Note: While these homes are no longer listed, search for current listings near Eglin and Hurlburt on MilitaryByOwner!